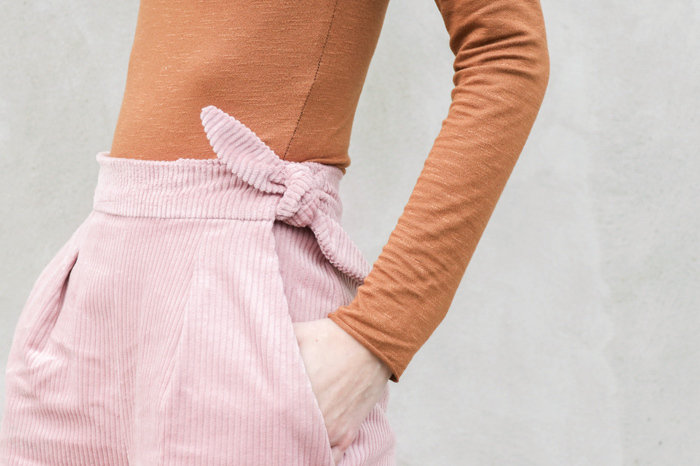 I’ve been dreaming about wide leg pink corduroy pants since the first moment I laid eyes on this fabric back in the fall. It had to sit in my to-do pile for awhile while other projects took priority, but I’m so happy I finally made it happen! I was originally torn between the Flint pants or Dawn jeans, but ultimately went with Flint because I just can’t get over that tie detail. Granted, this non-stretch corduroy is probably just a teeeeny bit too thick for that tie, maybe better suited for the button waistband option. But it still works and I’m still in love. 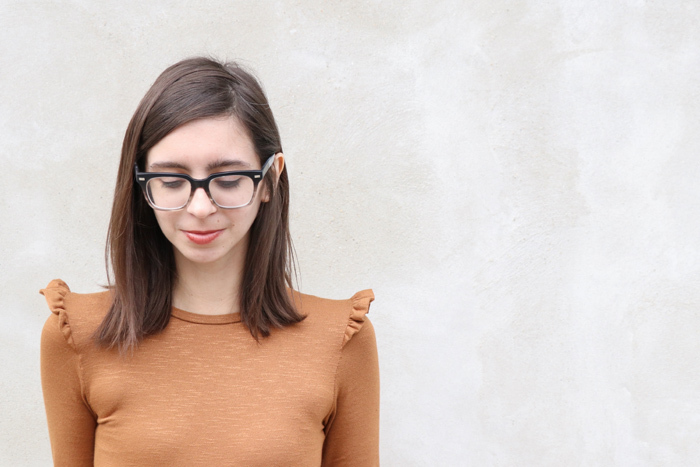 I paired it with yet another Rowan bodysuit, which is my ultimate me-made obsession. This is Rowan number 6 for me, and I’m not stopping making more! I added little ruffles to the shoulder seams on this one, and I might add a little how-to on my Instagram stories soon if you’re interested! Follow along with me at @hollydollydarling. Oh look, another Jarrah and Wattle combo, ha. After making a couple of Wattle skirts in shirting/quilting weight cottons, I’m absolutely loving how this rayon challis version turned out. So light and airy and floaty. It was a little bit difficult trying to match stripes perfectly for this bias cut version, with such a slippery fabric, but I’m pretty proud of how well it turned out. Another make that you’re sure to see again once spring and summer hit - its just screaming to be paired with an easy breezy tank! But for now I’ve paired it with this Jarrah sweatshirt - view D. It has a funnel neck and split sleeve hem. I had to add a band at the hem because of a cutting error (whoops! ), but it was a happy accident becuase I love it with the band! It’s made in a dreeeeeamy sweatshirt fleece. Seriously soooo soft and comfy on the inside. Funny - I never thought I was a funnel or cowl neck type of person. But out of all the Jarrah versions I’ve made, the two funnel neck ones are my favorites and most worn. Last year I wrote a post with tips for visiting yourself, and you can find that here. 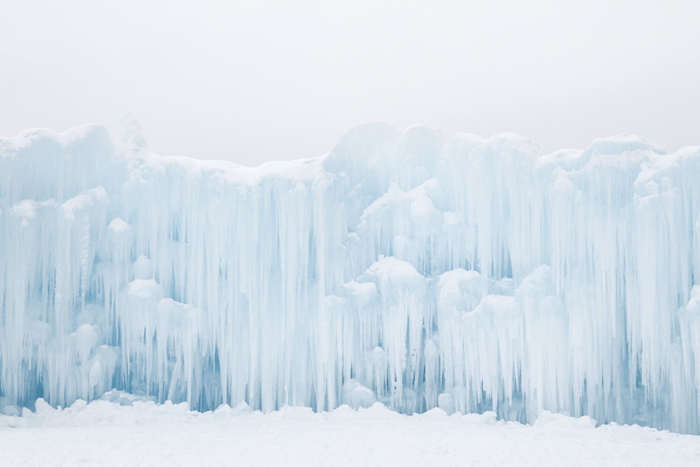 And you can see all of our past ice castle visits here! 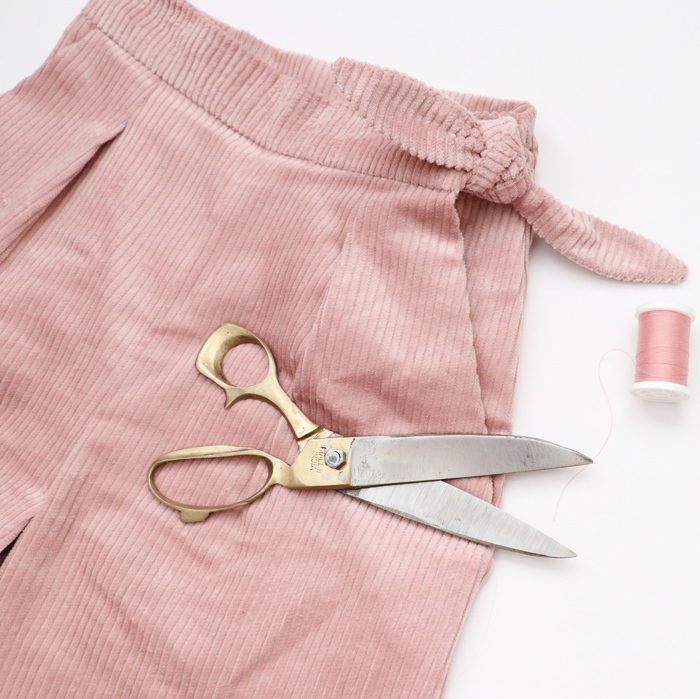 I’m so so excited to finally share this Flint trouser hack with you! When Meg first proposed this idea to me, I jut about jumped through the roof. THIS is my type of trousers. I live for overalls and jumpsuits, and this is no exception. they came out so perfect. I made these back in September, and wore them out to a local festival and again later for a night out, and they were so comfy (and got a few compliments!). I made mine from a rust-y brown twill from fabric.com. And I chose to do the tie closure instead of the button closure, because I love little details like that. But the bib works for either option. You can get the pattern add-on and view all the instructions for the hack over on Design Diary here, as well as a few ideas to change it up and make it your own. P.S - my top is a Megan Nielsen Patterns Rowan bodysuit in a striped jersey from Califabrics. Shoes are Swedish Hasbeens. I feel like I don’t share enough here photos from our day trips around New England, and I’m going to try and do that more! That’s one of the best thing about living in Boston - such easy access to so many other fun states nearby! We’ve visited Providence and Newport RI, Stowe VT, many areas in NH, and Acadia in ME. Before the new year, we decided to take a quick day trip up to Portland, ME for the first time to do a little exploring. visiting the LL Bean flagship store in Freeport- Penny loved the giant boot, the fish tank, all the animals, and the big chalkboard in the kids area! Coffee (and hot chocolate for P) at Tandem Coffee and Bakery - really fun and photogenic wall, too! It was kinda of a quick trip - it was cold, and the days are so so short this time of year. It’s dark so soon! But we really want to go back again in the summer when it’s warmer and the day is longer and we have more time to explore! 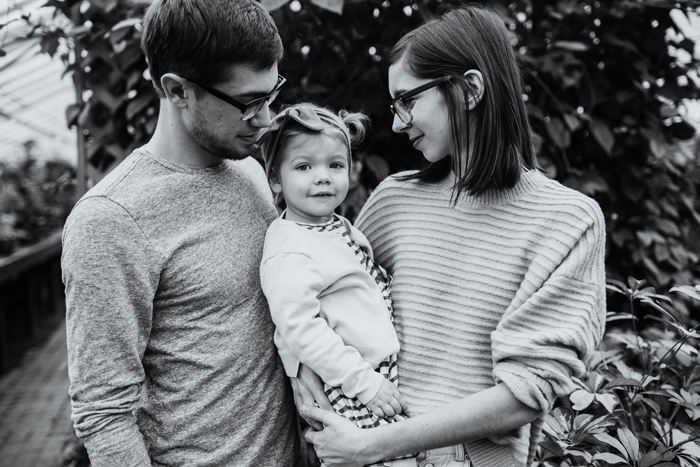 Anyone have any recommendations for other things to do or see that are also toddler friendly? AKA will not bore a 3 year old lol. Penny’s top: Simplicity 8754 in same fabric as mine. Mommy and Me fashion - it will never get old for me. I hope she lets me match with her forever. Can we talk about this fabric for a second? DO you know Star from Well Fibre? She runs a genius Instagram shop where she sells second hand fabric. If you aren’t following her, you should! She lists some true gems. When she posted a preview of this fabric, I was in looooove. And I stalked her page when it went live and jumped on it immedietly. And then the day it came in the mail, I was already cutting out my Wattle skirt. I just couldn’t wait. And I’m not disappointed. 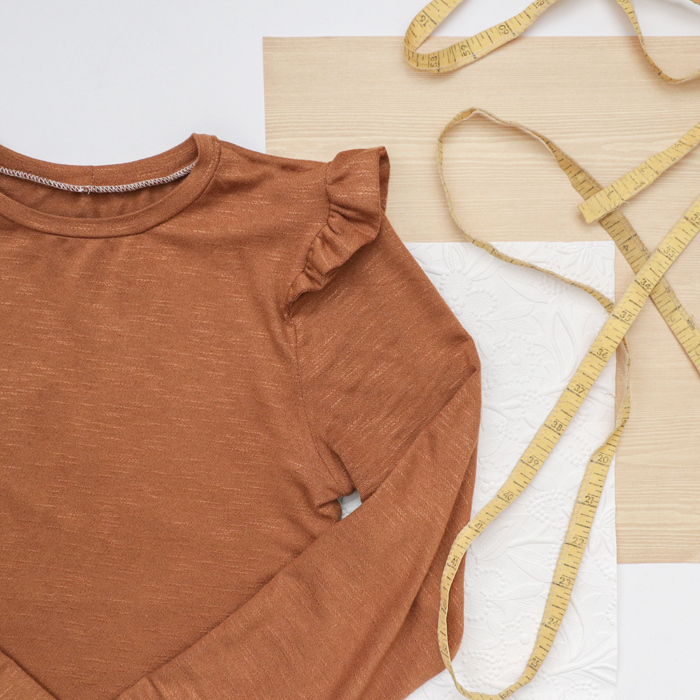 It goes perfect with my knotted Jarrah sweatshirt, but it will also pair so well with tees, tanks, and bodysuits when the weather warms up again this summer. I mean, it would also be perfect for another Hawaiian vacation. Soooooooo hint hint, Zach ;) . This version is bias cut view A with a buttom waistband. I didn’t get a good shot of the waistband, but I’ll get one next time I wear it! And heres Floreat number 3! This is view A - dress length with long sleeves, slit back opening, and inseam belt. I made it in a floral rayon crepe from Harts Fabric. It is so light and airy and floaty - I just want to spin and dance in it all day! This style and fabric combo is a little dressier than my every-day style, so I don’t know how much wear it will actually get. But wouldn’t it be dreamy for a fall/winter/spring wedding? Now, anybody getting married soon that wants to invite me? Stay tuned to Design Diary for the Floreat sewalong later this month! Another Floreat done! I had to squeeze in one more post before the end of the year (although i do have one more complete, I just wont get it posted until after the new year). This variation is the sleeveless dress version with center back zipper, pockets, and sliiiiightly raised hem. I also made a separate tie belt for when I want to wear it belted - love the option! But I think I really like it loose like this. I think I’ll especially like it when summer comes - the breathable linen and lose silhouette will be so airy and comfortable in the heat. And yes, I’m crazy for trying to photograph a sleeveless linen dress in the middle of a New England winter. I know. Today I’m sharing the first of my four Megan Nielsen Patterns Floreat tops and dresses! This is a knit version in a cozy mustard rib knit from Fabric.com. I made this one in one nap time sewing session- such and easy sew! I chose the cropped top version, and while I probably should’ve lengthened it a taaaaaad bit in the back (long torso problems), I’m still happy with the length. I’ll just only be wearing it with high waisted bottoms (worn here with my previously made Ash jeans). If you want to make a knit version, too (or any version of Floreat), keep an eye out at Design Diary next month for the sewalong tutorials I’m working on!